The mesenteric small intestine is a difficult organ to examine. Long-term experience has shown that there are no shortcuts to achieving a reliable examination, and several parameters need to be respected if a confident diagnosis is to be made. These include: selection of patients, closely supervised studies, background data, image quality, familiarity with imaging findings and utilization of radiologic-pathologic correlations. Thoughtful selection of patients by clinicians is essential to make radiologic examination cost-effective. Closed supervised studies, incorporating an adequate index of clinical suspicion, co-operation between a focused radiologist and a keen physician, expertise, and time are important. Familiarity with imaging findings and image quality, are necessary to guarantee demonstration of fine surface mucosal detail and transitional morphological changes. Applying the principles of radiologic-pathologic correlation to the interpretation of radiological findings offers a certain advantage and in association with the background data available, including localization and distribution of changes, extent of involvement, the solitary or multiple nature of the lesions present and the clinical history, enable a confident differential diagnosis. Based on its long-term follow-up results and its high negative predictive value, enteroclysis has been shown as a most reliable screening examination for the assessment of possible small bowel disease. Enteroclysis combined with computed tomography (CT) offers the advantages of both techniques. 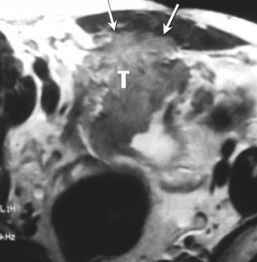 Distention of small bowel lumen and cross-sectional display are proven imaging qualities gained with CT enteroclysis. Available prospective data suggest that the technique is advisable in patients with obstructive symptoms, in patients with known or suspected malignancy and when assessing complications of small bowel Crohn's disease. Fig. 1. 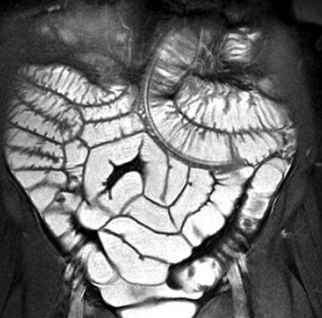 Coronal true FISP section demonstrating small bowel at its entire length. The use of an iso-osmotic water solution as an intra-luminal contrast agent resulted in homogeneous opacification of the bowel lumen. Note the increased conspicuity of the normal bowel wall due to the high resolution capabilities and total absence of motion functional information provided by MRE equals that of enteroclysis alone, whereas the inherent advantages of an MR imaging approach over enteroclysis include detection of extra-luminal pathologic conditions, and detailed morphological evaluation of the bowel wall, as well as of the entire abdomen. Moreover, MRE has a distinct advantage over the currently available CT enteroclysis technique, due to its ability to provide real-time functional information. Clinical entities that may require radiological investigation of the small intestine most frequently include Crohn's disease, small bowel neoplasms and Meckel's di-verticulum.